The American Federation of Musicians Local 47 serves to promote and protect the concerns of professional musicians in all areas of the music industry. Members of AFM Local 47 are high-level studio musicians, signed to major and indie labels, work on major motion pictures and television, tour throughout the world, and are members of premiere orchestras and symphonies including the LA Philharmonic, LA Opera, Pasadena Symphony, Hollywood Bowl Orchestra and more. Our members are arrangers, composers, producers, contractors, engineers, and freelance musicians, regarded as some of the very best in the world. Formed by and for Los Angeles musicians in 1897, AFM Local 47 members united together to advocate for fair wages and working conditions, oppose the forces of exploitation through solidarity and collective action, and preserve the dignity and respect all professional workers deserve. 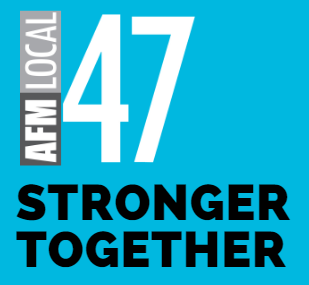 Headquartered in Burbank, California, AFM Local 47 serves musicians working in the counties of Los Angeles (except for Long Beach, covered by AFM Local 353), San Bernardino, Riverside, and Ventura. As an affiliate of the 80,000-member American Federation of Musicians of the United States and Canada, AFL-CIO, we negotiate with employers to establish fair wages and working conditions, and our officers and staff enforce union contracts to assure professional standards and treatment for musicians. Affiliated with the American Federation of Musicians of the United States and Canada, AFL-CIO, we negotiate with employers to establish fair wages and working conditions for our members. As a proud member of the Los Angeles County Federation of Labor, California Labor Federation, and AFL-CIO, we work alongside our fellow labor unions at home and abroad to champion social and economic justice for all workers. Learn more about the benefits of union membership.